Tomorrow is on its way, and it’ll be here faster than many of us may think. Sure, we don’t see many robots passing us in the streets, yet, but even those tiny devices that we now lug around with us are far more intelligent than those funny-looking humanoids we used to watch on the kiddie sci-fi series The Jetsons. And just wait until machines start teaching themselves (aka “machine learning”) – that’s when things will really get moving. Right now, we are poised on the launch pad of an exponential development in technology. Remember how exponential works? First comes, 4, then 8, 16, 32, and so on. That gentle Wind of Change we heard so much about back in the 90’s will very soon become a bona-fide whirlwind. Nothing against this speedy pace - but if everyone is only worried about moving as fast as they can, who will stop and consider where we are heading? Who is Mission Control for Humanity when we need it? Who is authorized to make these decisions in our name? Right now, it seems that (some) scientists, some venture capitalists and big technology companies are in charge, albeit without any proper supervision. Facebook, Linkedin, Twitter and Baidu determine whom we communicate with and what about. Tinder and Parship decide whom we meet and with whom we fall in love. Apple, Google and their ilk tell us what’s supposed to be interesting. Tesla, Uber, and Waymo are behind our steering wheels. IBM is working on quantum computers, compared to which the human brain seems pea-sized. Google’s Magenta Project may one day lead to Artificial Creativity. And all that’s just for starters! But lets be clear: Technology itself is neither good nor bad; it is morally neutral, just a tool. Tech writer and Wired-co-founder Kevin Kelly once said that “computers are for answers; humans are for questions”. Lots of people don’t understand this, or, they don’t care who shapes their political and social futures. How else to explain the sudden rise and fall of the Pirate Party in Germany in 2011/12: this movement had nothing to offer except a kind of liquid democracy involving unconditional basic income ideas, strong data/privacy protection, a revolt against antiquated copyright laws, and plenty of internal chaos – and that was all. So what is to be done? Why not start by waking up? We need progressive politicians who are willing to stand up and GET INVOLVED. Social democracy (Sozial-Demokratie) used to stand for policies that put the latest technologies to work in the interest of social progress. That was the reason Lasalle and Bebel founded the SPD (German social democratic party, center-left) in the first place, 155 years ago. Today, local and regional chapters of the SPD are actually debating the need to shut down the party’s Facebook page because, as they say, Facebook "cannot be trusted anymore".That is an essentially conservative stance, and one that leads in a completely wrong direction. But the German SPD is hardly a lone example. The collective demise of social democracy in Europe is the result of the parties’ lack of answers to technological change. Sadly, there are no other progressives in sight to whom we could turn could fill the gap. This refusal to do the job and general lack of perspective on the part of the former progressives is a clear and present danger for our liberal democracies. We really need to worry about digitization, automation, virtualization and globalization if it is taking place beyond our control or that of responsible political forces. Despite Europe’s fairly strong economies and solid job markets, populists are being elected right and left simply because they postulate a deceptively simple view of the future: Stop change in its tracks, they say! Bring back the past, parties such as AfD, FPÖ, and SVP (far-right wing parties in Germany, Austria and Switzerland, respectively) demand – instead of thinking about ways to shape the future.The answer to this kind of reactionism is not to stop making promises, but to make better promises! That is why we need future scenarios that heighten our curiosity, raise our hopes and force us to look forward. Machines and intelligent algorithms may free humans from many hateful jobs – scientists are talk about the possible elimination of 60-85% of all routine work. It will be the dull and the repetitive grunt stuff that we will one day delegate to robots and AI. 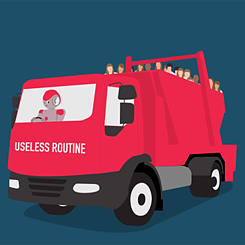 As long as our basic needs are filled, we humans may finally be free to involve ourselves with other things (or other people) and to perform tasks that will actually make the world a better place. © Gerd Leonhard And there’s even more to come. Vertical farming and protein from petri dishes (‘lab to fork’) may, before too long, make hunger and malnutrition things of the past, as well as helping us achieve our climate goals (not to mention the animals and their welfare). 3D printers may well do away with the need to transport many products over long distances; instead we can simply print them on-demand (like GM’s 3-D printed seat brackets). And since carsharing services could be sending a self-driving car right to our doorstep, fewer people may feel the need to own a car anymore. Cloud-based healthcare records and the imminent convergence of biology and technology will lead to forms of personalized medicine that will be both simpler and cheaper to administer, improving the health and lives of everyone. Unfortunately, this whole story sounds too good to be true, at least as long as the storytellers all reside in Silicon Valley, and increasingly, in China. Here in Europe, also stoked by Hollywood, we prefer to splurge on apocalyptic fantasies. Not that the fears thus articulated are completely unfounded: There is a serious danger that our data and our connectivity itself will be misused, and that exponential technologies such as AI could spiral out of control. We should therefore probably mistrust all overly optimistic narratives about the future – instead, what we desperately need is a good mix of foresight and optimism, with a pinch of public and private control added in for good measure. This, of course, will require politicians who are both courageous and questioning. Tomorrow’s on its way! Wake up and join us! We all need to think big, even exponentially, instead of linearly as in the old days; that’s if we want to inspire the future and turn it into a strong promise. The world will continue to change, faster and more thoroughly than ever. “Business as usual” in processes and regulation won’t help us to set the necessary switches and change our direction. It’s fine for the Green European parliamentarian Jan Albrecht to say that “data is the new oil” and demand more protection. But if all it leads to is too much regulation in the traditional sense, not much is gained. As an example, the EU’s General Data Protection Regulation (GDPR) might be seen, by some, as yet another bureaucratic monstrosity whose only result so far has been loads of emails instead of increased data security and transparency. Data can, of course, still escape EU jurisdiction. So why not create a safe harbor for data here in Europe; why aren’t there calls for an EU Cloud? 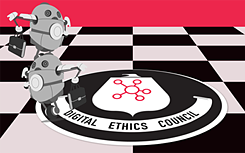 © Gerd Leonhard We think what we really need is a European “Digital Ethics Council” (more on that here) to give politicians and public figures guidance for future-oriented action. This body should consist of thinkers scientists and researchers from across the political spectrum, philosophers, authors, thought-leaders, and artists. Its mandate should be to conduct and popularize an ongoing debate about the framework within which exponential technologies should exist, in the future. It should publish recommendations for states, governments, politics and business to follow, thus giving impetus and direction to these discussions. These could then form the basis for multinational and global agreements. Tomorrow’s on its way, and its coming faster than you think! In some places, it’s here already – only we haven’t noticed yet. It will bring lots of magic which we all can experience and share. But to ensure that it works for the betterment of humanity and not the other way around, we need to get involved, to shape the future in the ways we want. We must be ready and willing to dream, and if necessary, to fight. We’re heading for tomorrow today. Wake up and join us! 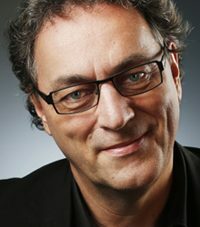 Gerd Leonhard is a world-renowned futurist, keynote speaker, author and future consultant. His films on technology, people and the future are widespread and extremely popular. Over 300 leading companies from 30 countries like to rely on Gerd when it comes to a holistic understanding of the near future. After working as a professional musician and producer, and later as an Internet entrepreneur in the USA, in 2001 he found his current passion: the future, and the confrontation with exponential technologies, which we are currently experiencing everywhere. Gerd sees and describes the advantages as well as the disadvantages, but he is basically more of an optimist. Gerd's central message is that all technology should first and foremost serve collective human happiness, and that we should welcome technology but not become it ourselves. Tim Renner is a German music producer, journalist and author. Renner initially worked as a journalist for NDR, Tempo magazine and Tango city magazine, among others, before moving to the music industry in 1986. 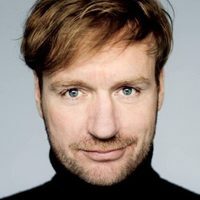 In 1994 he founded the Universal-Sublabel Motor Music, in 2001 he became Music President and Managing Director of Universal Music Germany. In 2003 he was named "Global Leader for Tomorrow" by the World Economic Forum. Renner is a long-time lecturer in the music business program of the Pop Academy Baden-Württemberg and was appointed professor there in 2009. He is a member of the SPD and is an associate member of the board of the "Cultural Forum of Social Democracy". From 2014 to 2016 Renner was State Secretary for Culture of the City of Berlin. In the 2017 Bundestag elections, Renner ran for the SPD as a member of the Bundestag in the Bundestag constituency of Berlin-Charlottenburg - Wilmersdorf, but was narrowly defeated by his CDU competitor. Copyright: Text: Gerd Leohard, Tim Renner. This work is licensed under a Creative Commons Germany Attribution – NoDerivs 3.0 Germany license.